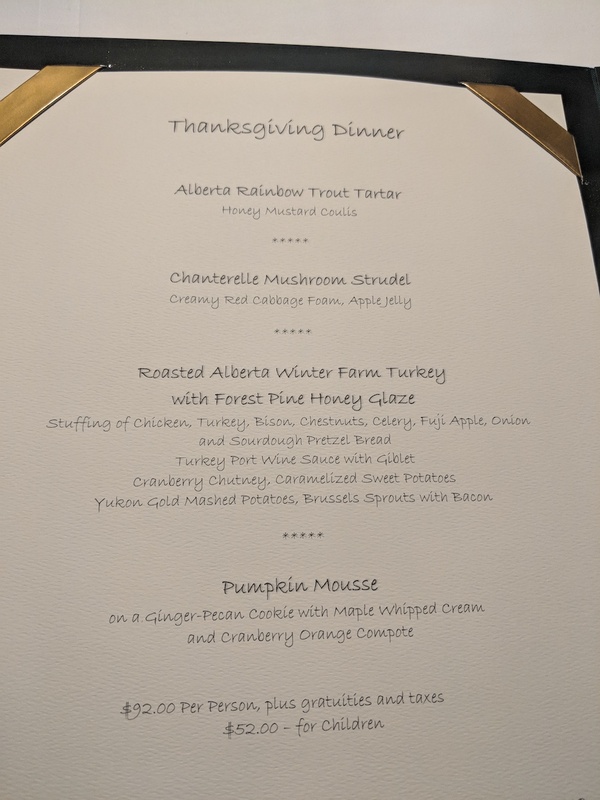 The Post Hotel is a lovely place to spend and celebrate Canadian Thanksgiving. The holiday falls on the second Monday in October, but many families celebrate with a bountiful Turkey Dinner on the Sunday. 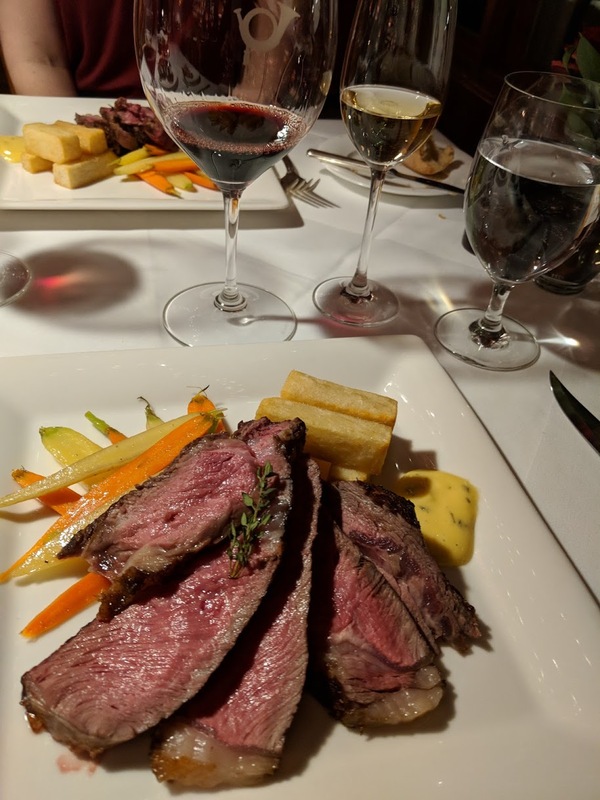 This tradition is upheld beautifully in the dining room at the Post for all of their guests, which on that evening swelled to include many Calgary and Banff-area residents gathering in large, multi-generational family groups and for a delicious dinner. The wine lovers’ dilemma with almost any tasting or multi-course meal is what to pair with all the variety. Glancing at the menu you’ll see that we had a trout tartar, strudel, and turkey- with-gravy riddle to solve. 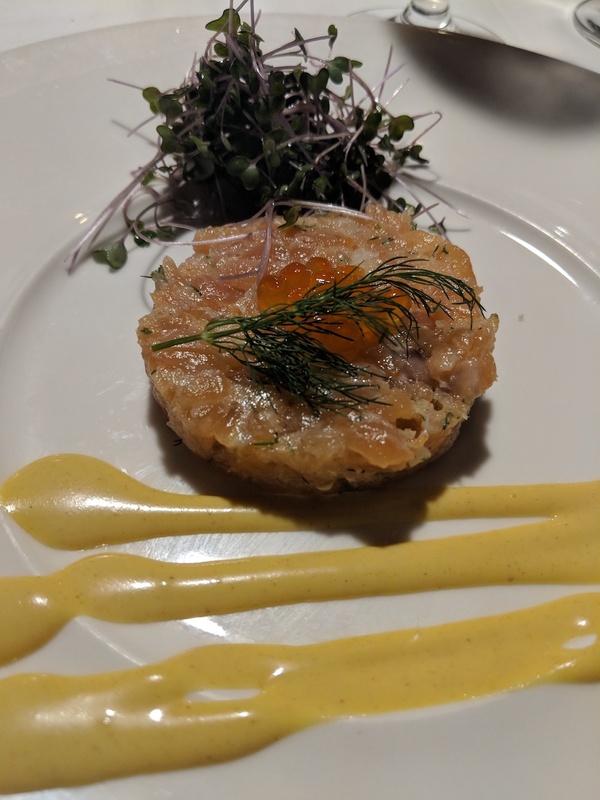 The Billecart-Salmon completed the first piece of the puzzle, complementing the amazingly luscious tartar which was matched perfectly with a sharp-sweet-creamy honey mustard coulis. 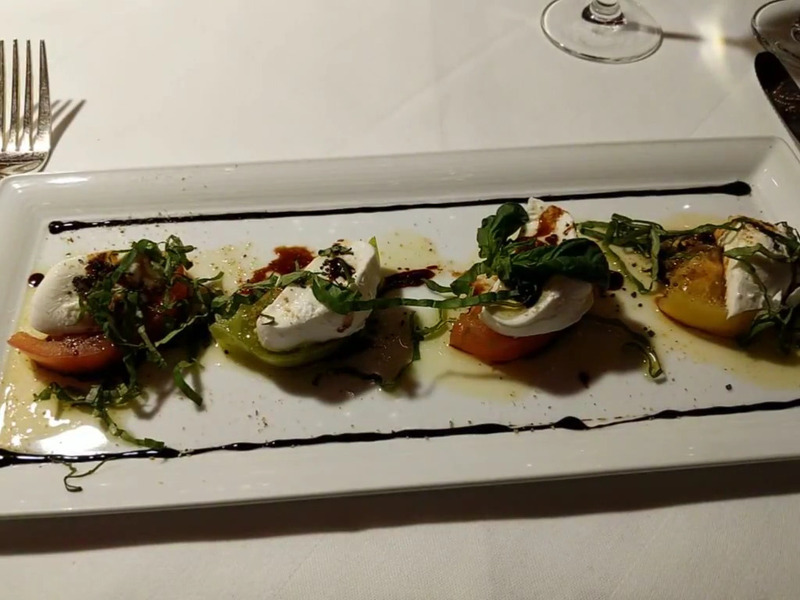 The photo doesn’t lie – the portion was very generous. The second course was also a fine partner for the champagne. The strudel filling was a blend of finely-chopped rich and earthy mushrooms wrapped in delicate, buttery phyllo pastry. 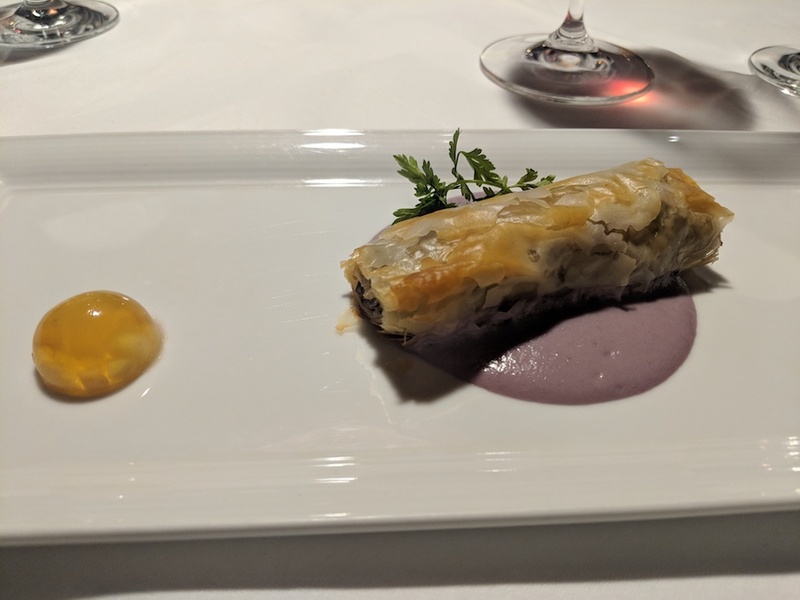 The red cabbage foam didn’t photograph particularly well (looks a bit like blueberry yogurt) but it was prettier in person and very good with the strudel. The shiny golden ball on the left is the apple jelly – delicate, tart and sweet, and refreshing. And here it is – Happy Thanksgiving, Turkey dinner is served! I have had wonderful homemade turkey meals over the years always prepared by loving hands, and nothing can quite replace the ambience of that special family gathering. 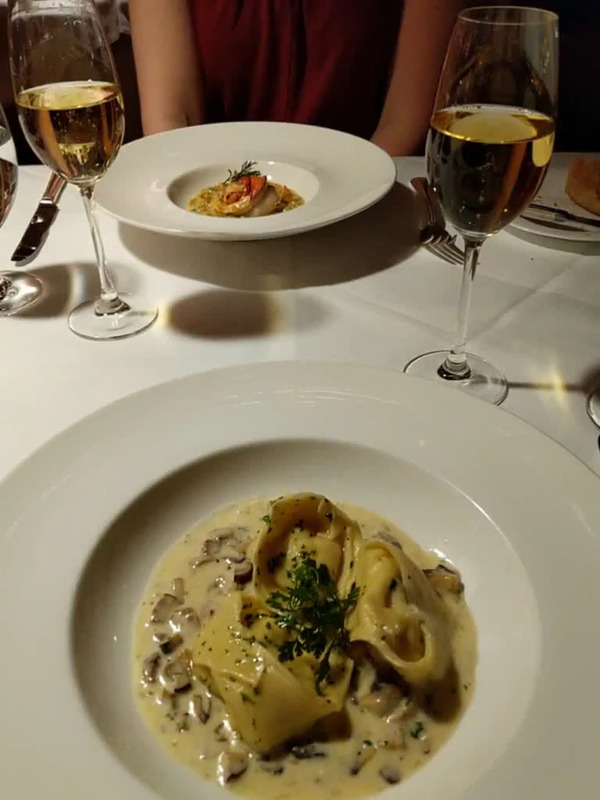 But I must say that this meal was outstanding. The white and dark meat morsels of turkey were moist, tender and…just what turkey should always be. 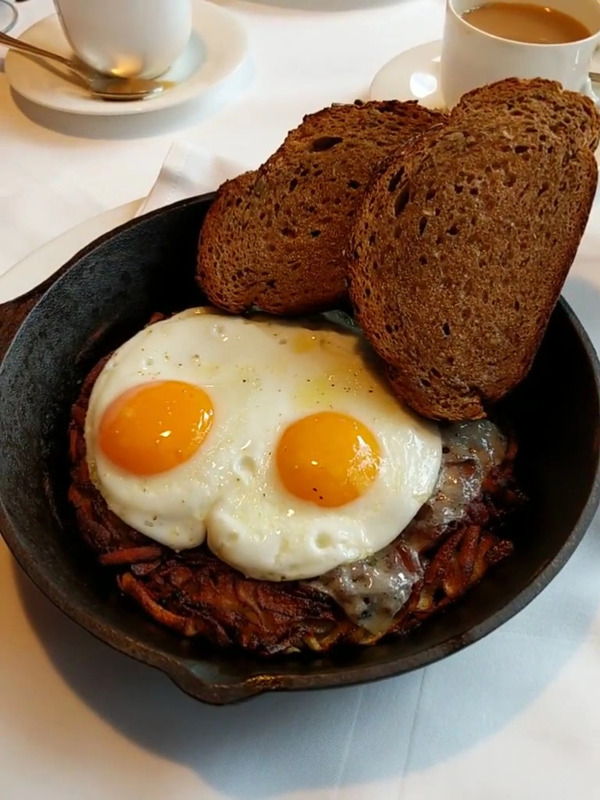 The cornucopia of ingredients in the stuffing – chicken, bison, fuji apple, chestnuts, sourdough pretzel bread, to name a few – made for an impressive accompaniment. 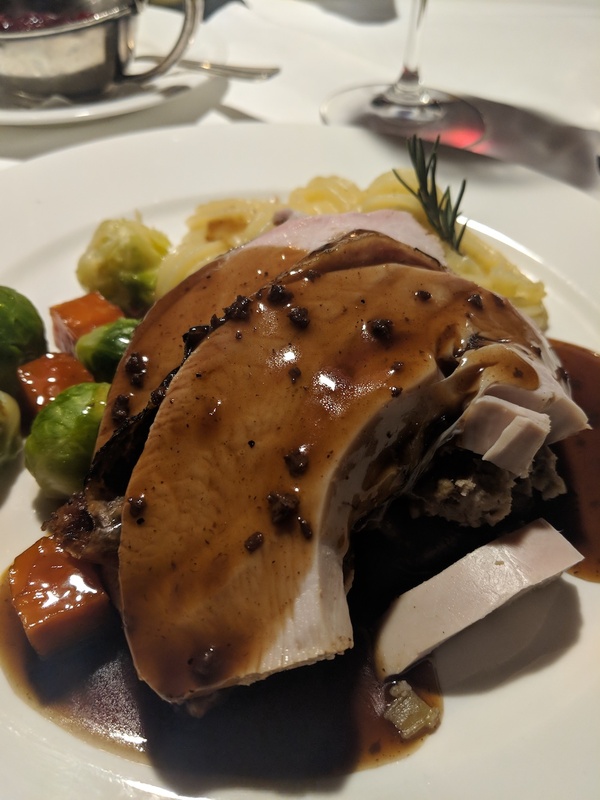 The turkey port wine sauce was a rich pool of gravy, the kind you encourage everything on your plate to touch and sop up. (And while I admit to eating and enjoying the canned stuff, the spiced cranberry chutney was out-of-this-world – so good!). Even the brussel sprouts and carmelized cubes of sweet potato were perfect. 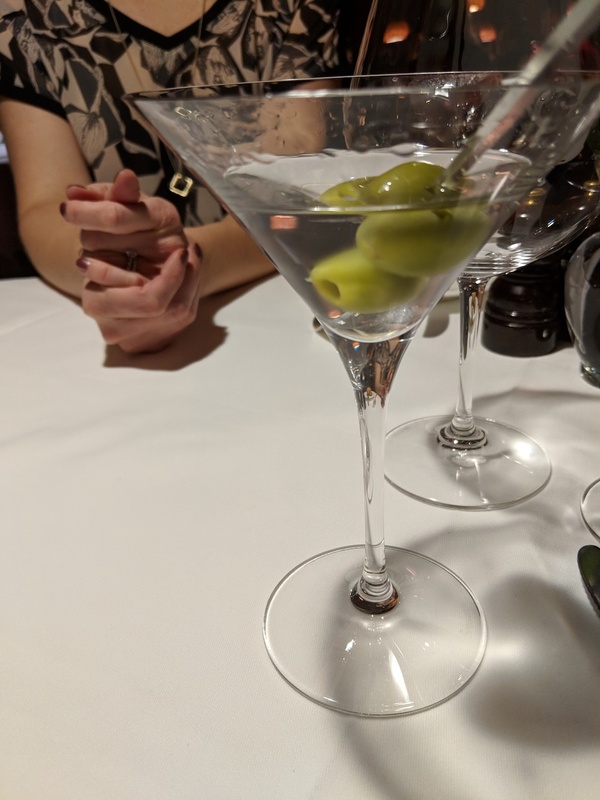 Apologies – we don’t have a shot of the lovely dessert (must be that Turkey/Tryptophan effect). It was a Pumpkin Mousse with Ginger-Pecan cookie, maple whipped cream and orange/cranberry compote – but like all Post desserts, it was delicious and generous. The meal may not have been ‘homemade’, but it was certainly made with loving care. The many families surrounding us, clearly engaged in a yearly tradition, confirmed that this is a wonderful place to celebrate the holiday. 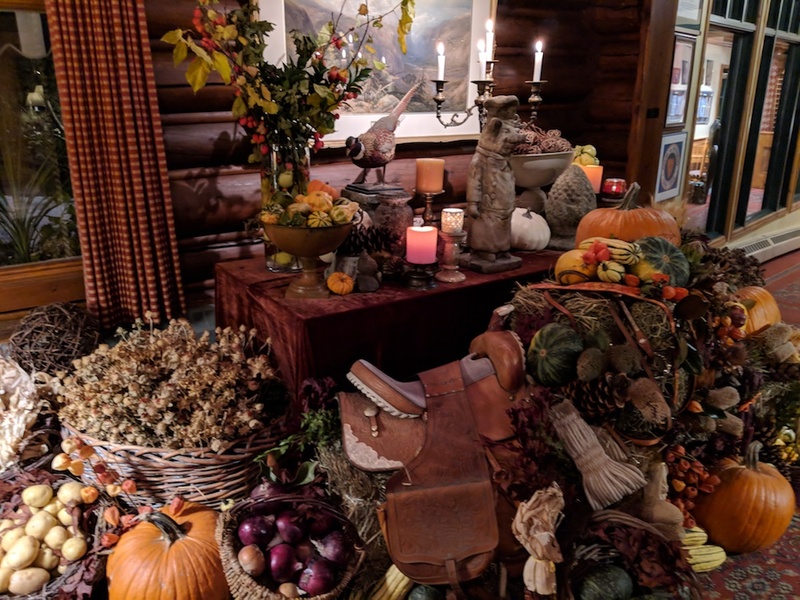 While I’m sure we now have you dreaming of visiting the Post Hotel in October, it should be noted that the Canadian Thanksgiving weekend in October is also the last weekend the hotel and dining room is open before a five-week closure as staff prepares for the busy winter ski season. 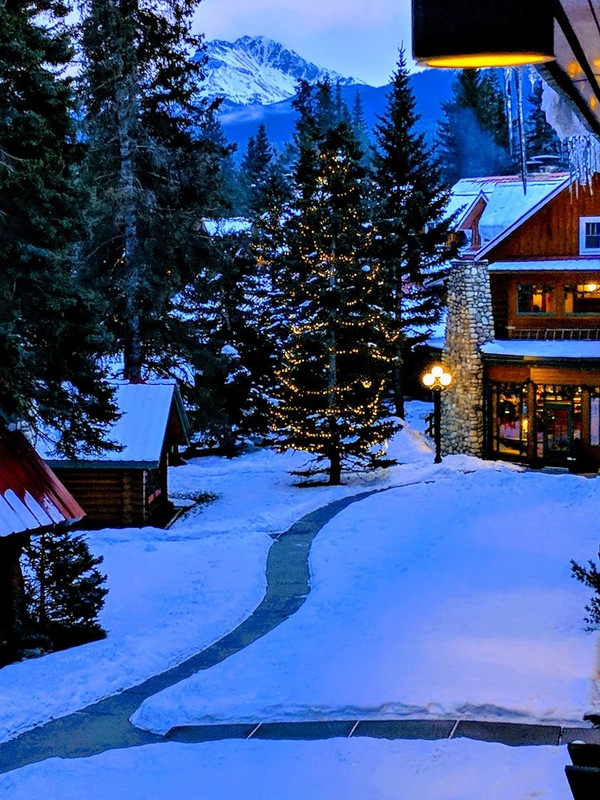 So, our suggestion is to aim to spend a few crisp, early-October days in the Rockies at the Post, ending a great stay with a spectacular Thanksgiving dinner you won’t soon forget. 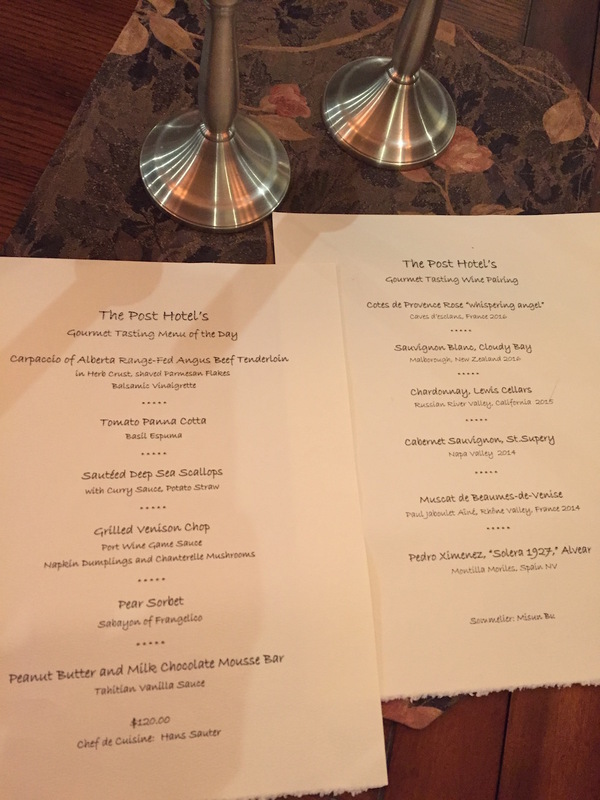 The Post Hotel Dining Room offers a tempting and ever-changing Tasting Menu daily. We knew that during our four day stay we’d go there at least once or twice. But on some evenings, it’s nice to let the wine steal the show. 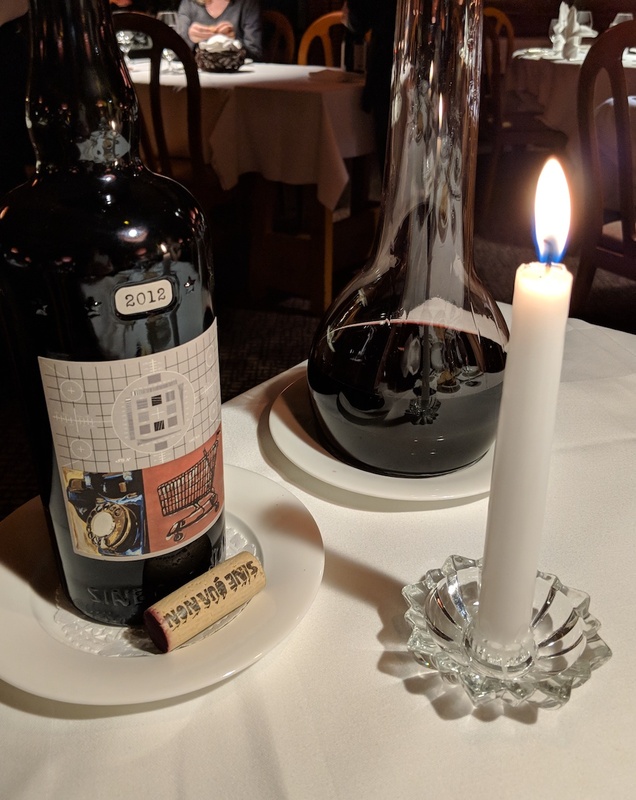 So, for the first dinner of our four day stay, that’s what we did selecting a rare bottle indeed – the 2012 Sine Qua Non Rattrapante. 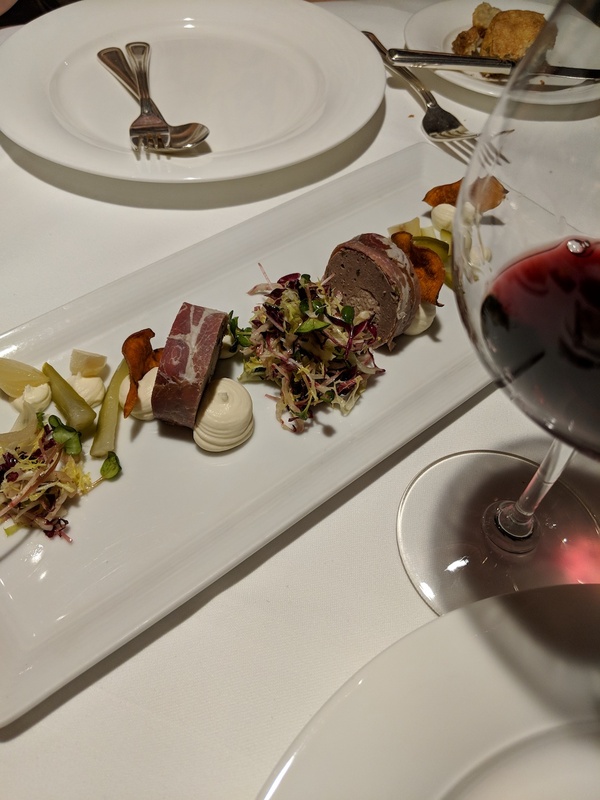 Before the big wine event, we kicked things off with a cocktail and the chef’s terrine for the evening, featuring venison mousse, tarragon and pork. 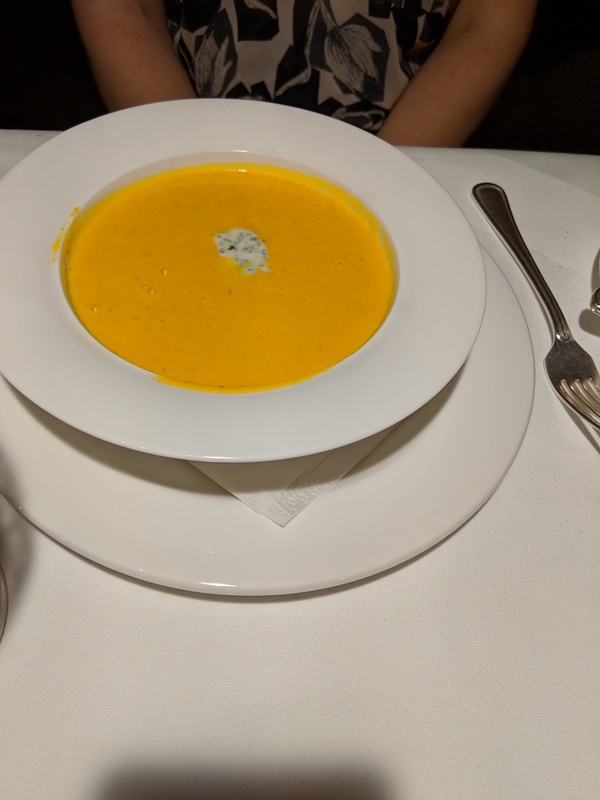 We moved on to soups for a second course, Lobster Bisque for him, and for me the featured soup – a cheerful, smooth and pleasantly spicy blend of Carrot and Ginger. 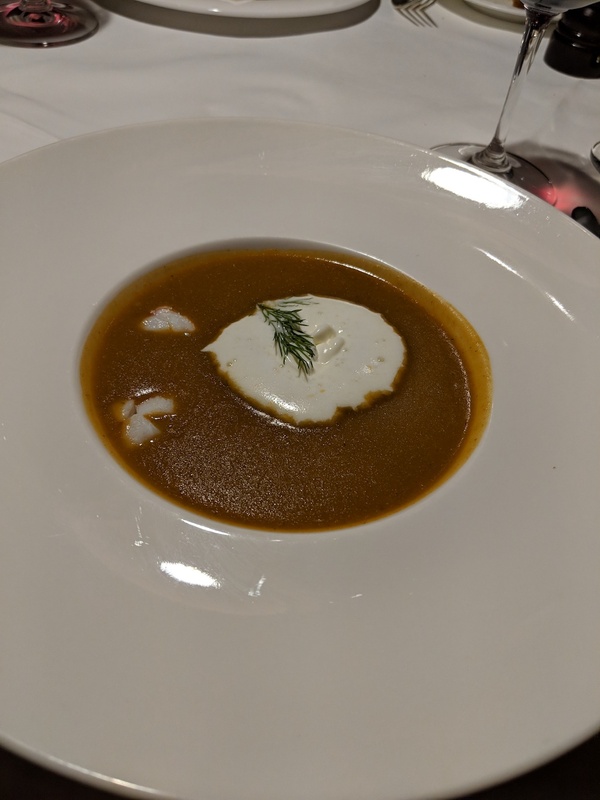 In terms of quantity, it wasn’t necessary to have a soup course, but enjoyable (and we did split the terrine, after all). 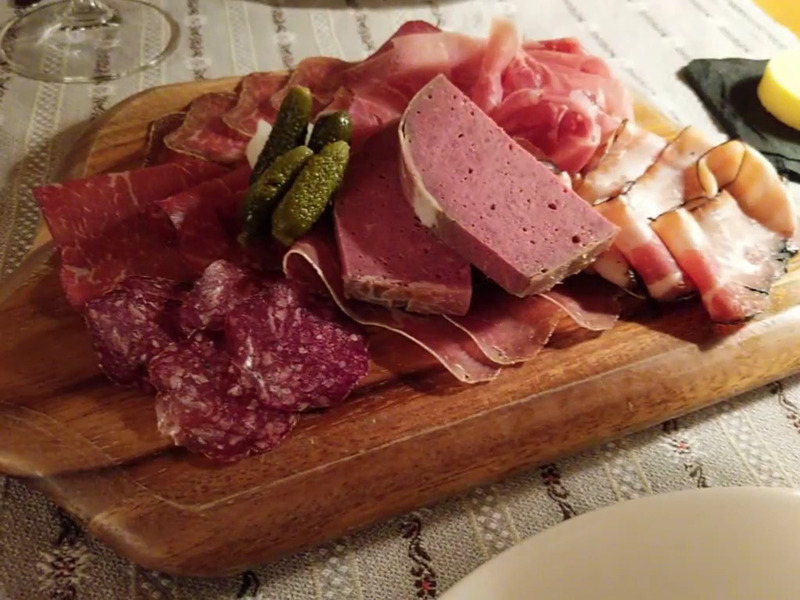 We also quite literally did not have anywhere to rush off to tucked away in this tiny mountain village…might as well enjoy a great meal! Now back to the wine. 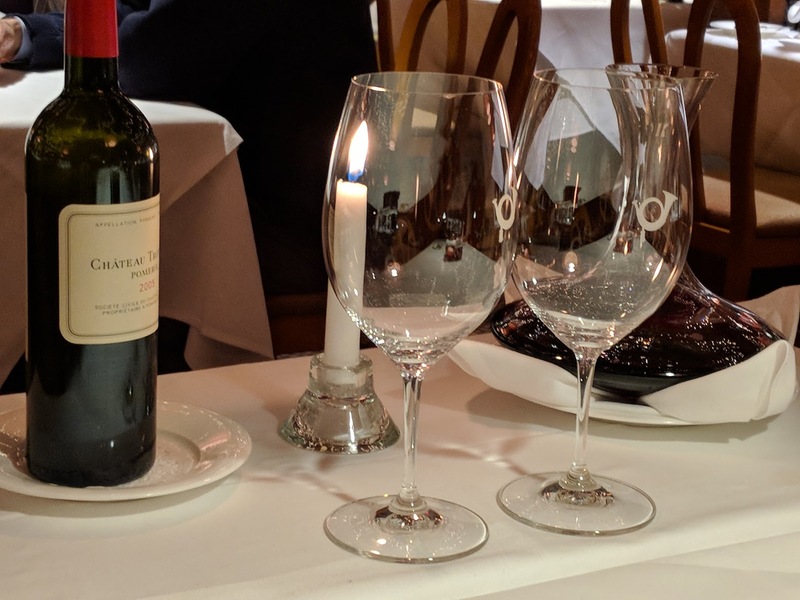 Boasting a collection of over 25,000 bottles and 2300 selections, the Post’s wine cellar is reason enough to make the trip. In recent years, it seems that the inventory has been diminishing somewhat. But nevertheless, there always something special to be found. The phone book sized wine list is still fun to sift through, and the sommelier can provide further guidance. 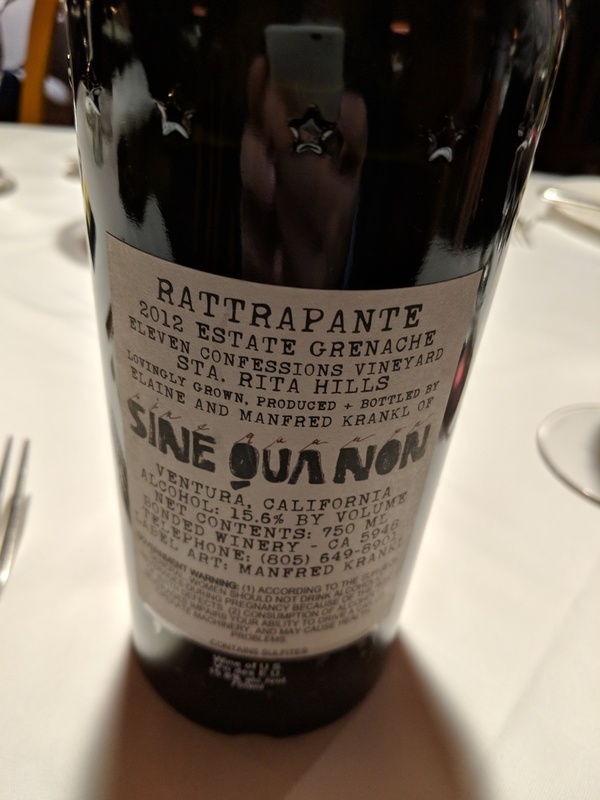 On this evening, we narrowed our choice to an intriguing California Grenache, the 2012 Sine Qua Non Rattrapante. Sine Qua Non wines are hard to find and always interesting and memorable. 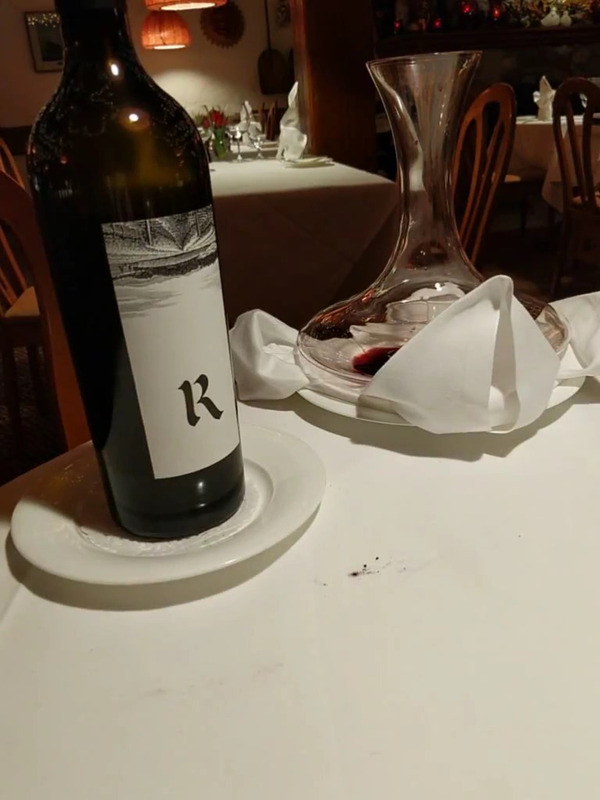 This particular wine was big and beautiful with a lovely color (decanting was necessary, no surprise there). The quirky label adds to the impression that this is a rather eccentric one-of-a-kind wine, one you’ll not soon see again. 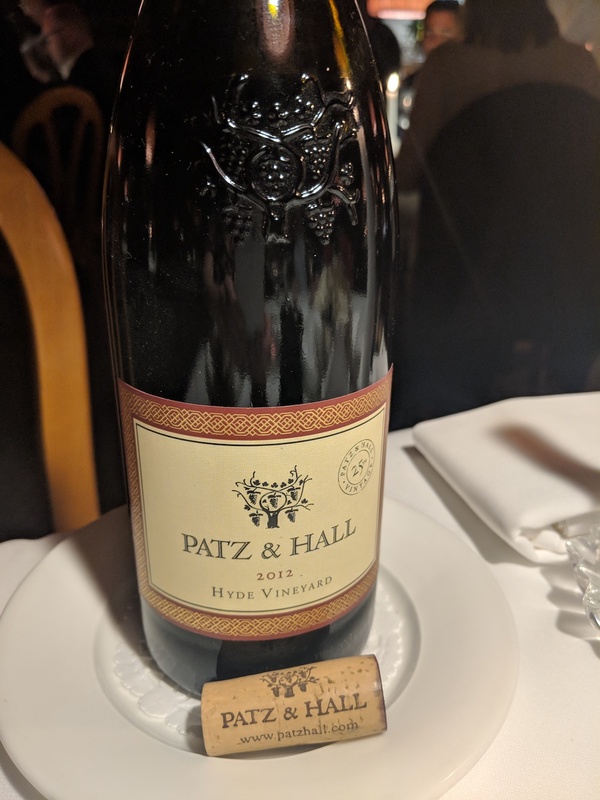 The wine paired very well with our main courses (although we would have sipped it anyway). 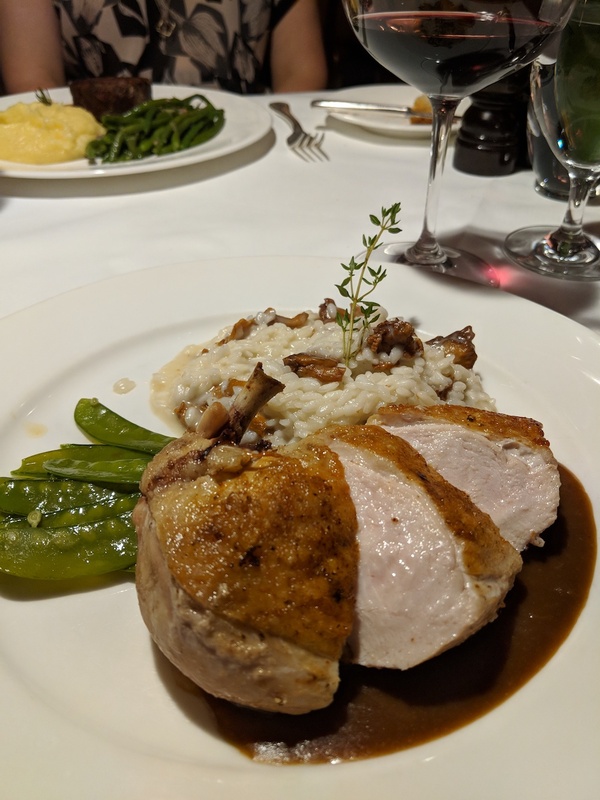 For him – Roasted Alberta “Valley Ridge Farms” Free Range Chicken Breast and risotto with chanterelles. 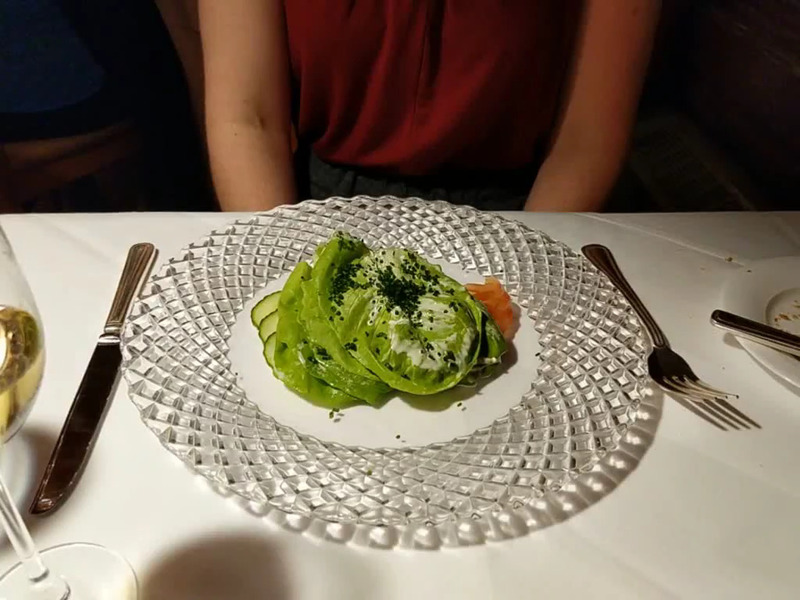 We were surprised at the ‘bite’ on the risotto – a bit underdone this evening when it’s usually outstanding. We’ve dined here often enough to declare this to be an outlier (I wouldn’t hesitate to order it again). For me, I wanted something that I knew would let the wine shine, no contest. 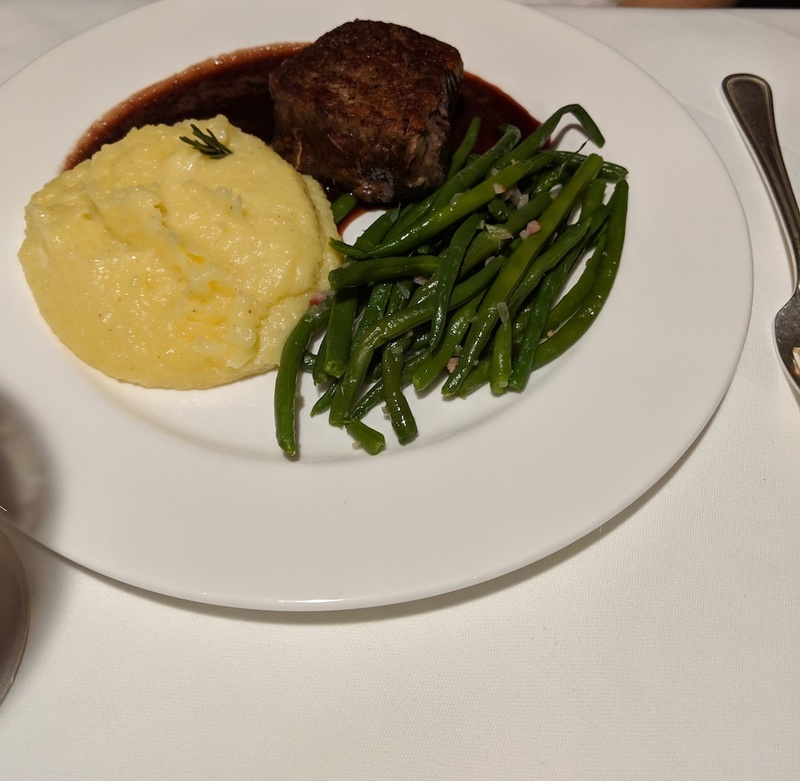 I played it very safe and went with the Beef Tenderloin with Port Wine Sauce and Yukon Gold Mashed Potatoes. 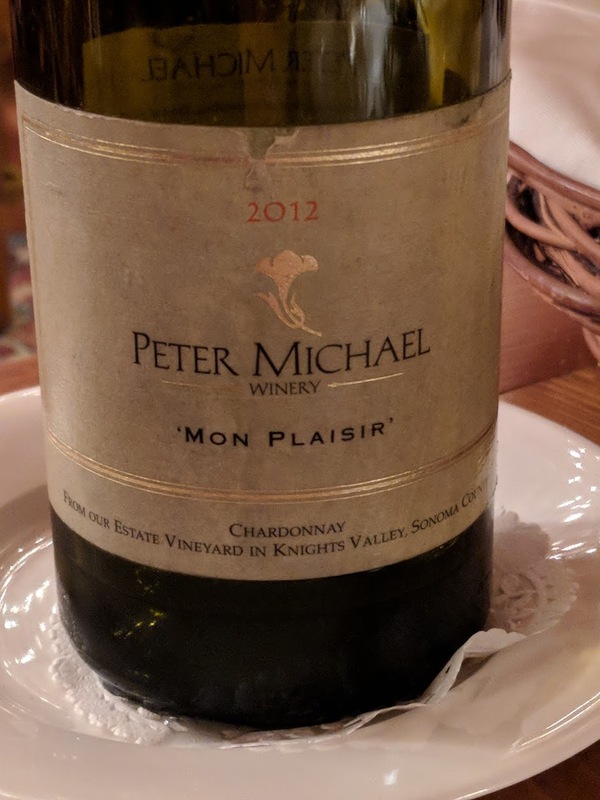 It was everything I’d hoped, more than I needed, and yes – went great with the wine. 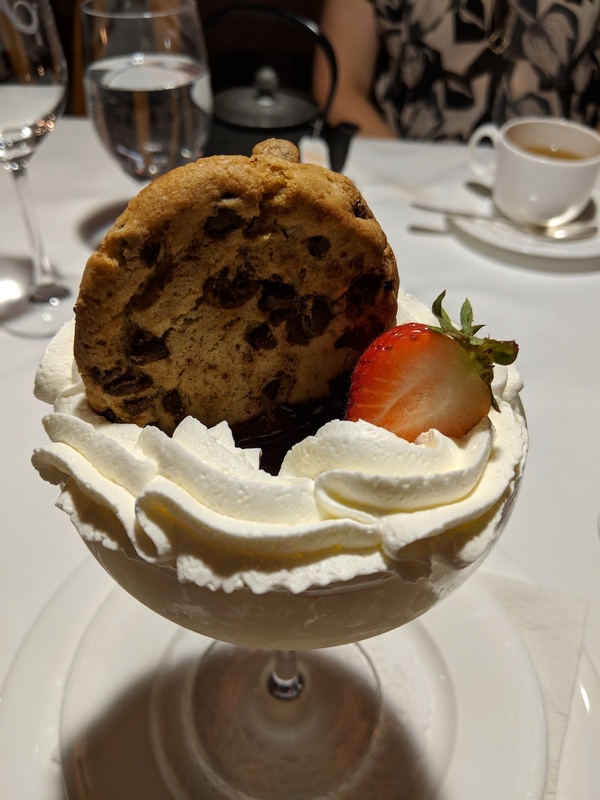 To satisfy a sweet tooth, we ordered the famous Coupe Danemark, a glorified and glorious hot fudge sundae with a fresh-baked chocolate chip cookie. 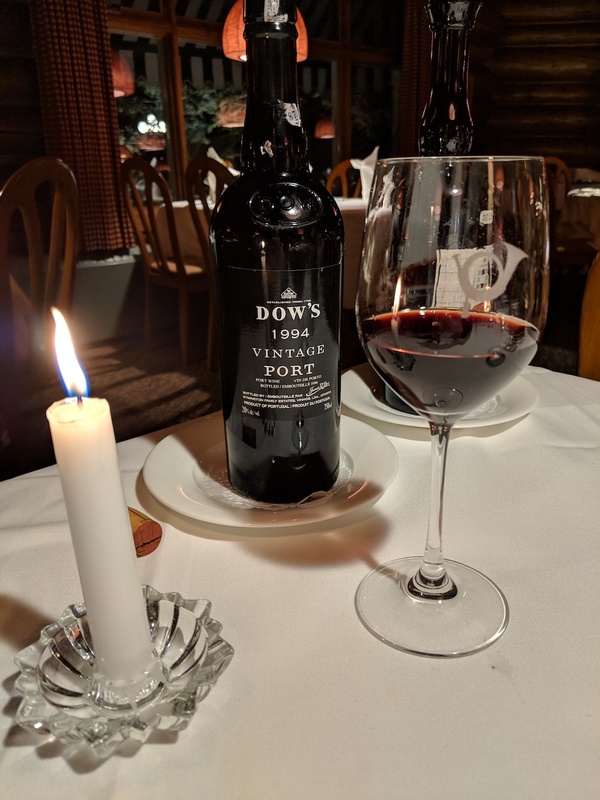 Finally, to cap off a great meal we ordered a bottle of 1994 Dow’s Vintage Port. 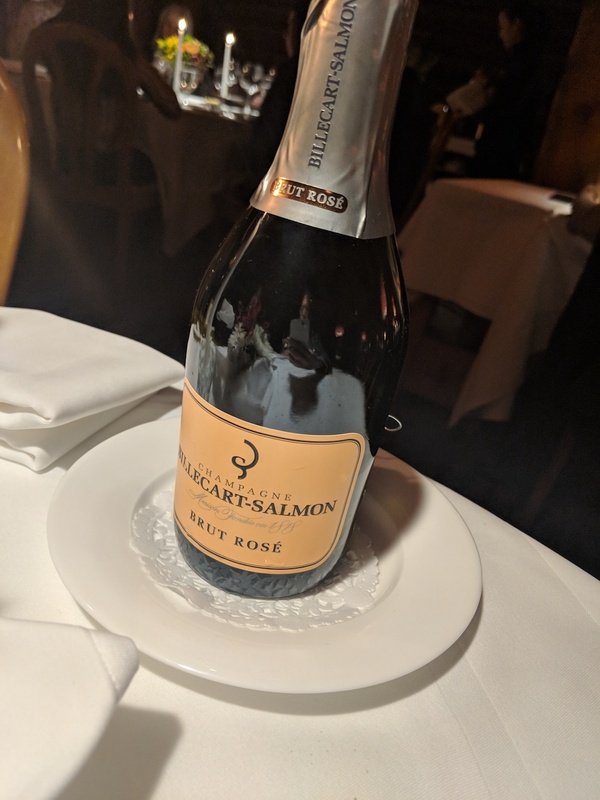 It was spectacular, and after enjoying a glass we had our wonderful server put it aside in the cellar so that we could revisit it after our following meals. 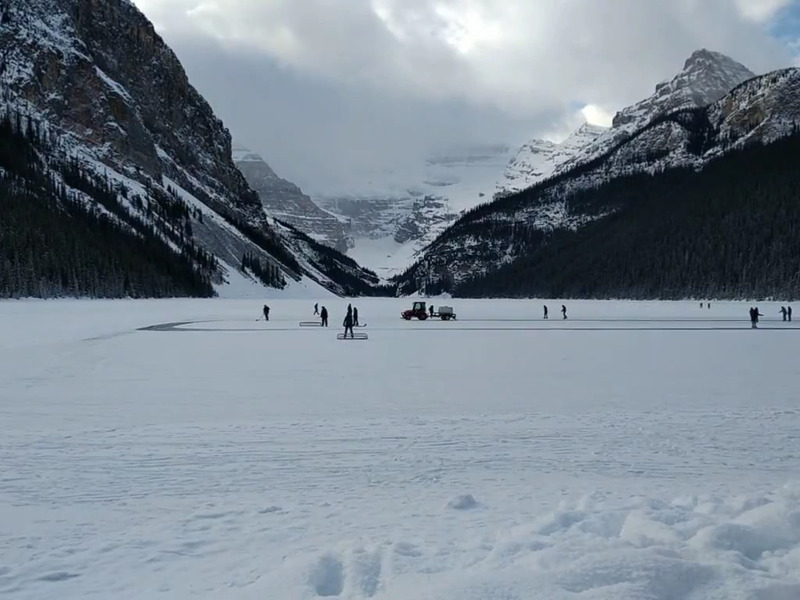 The iconic turquoise blue lake is frozen and covered in snow, but cleared enough to skate on — and even to play an impromptu game of hockey, Canadian-style. 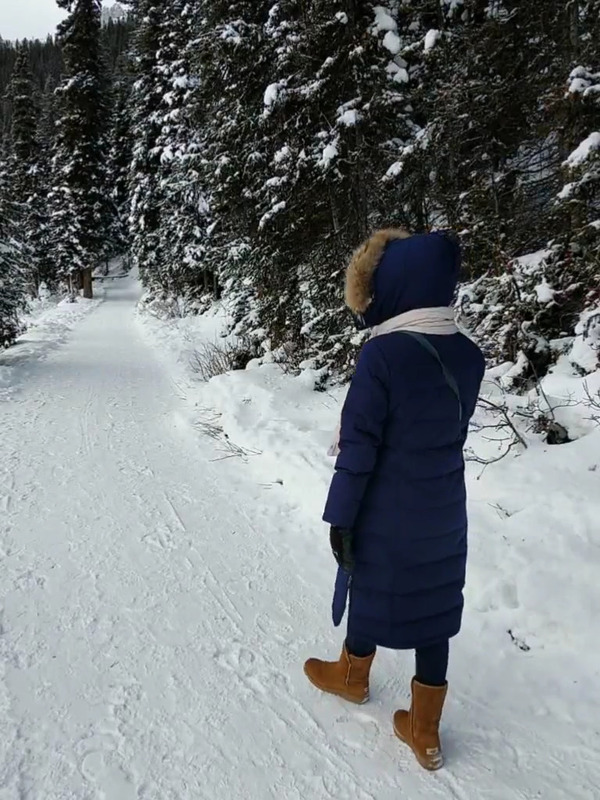 At some point, as beautiful as it is outdoors, you want to head inside – and in our opinion there’s no better place to do this at Lake Louise than at the Post Hotel. 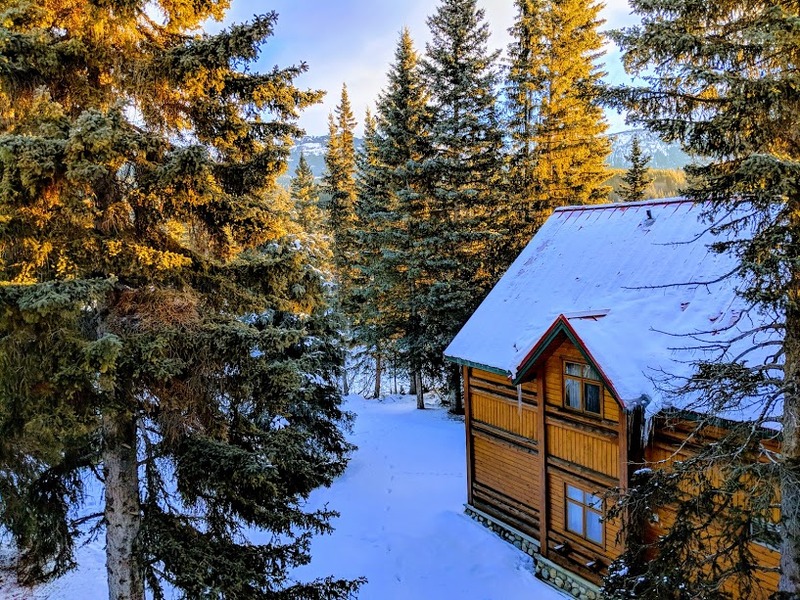 Nestled among the pines just outside of Lake Louise village, the Post is just enough off the beaten path to let you breathe, and close enough to everything that means getting there is no chore at all. …And just look at that magical evening view from our room! 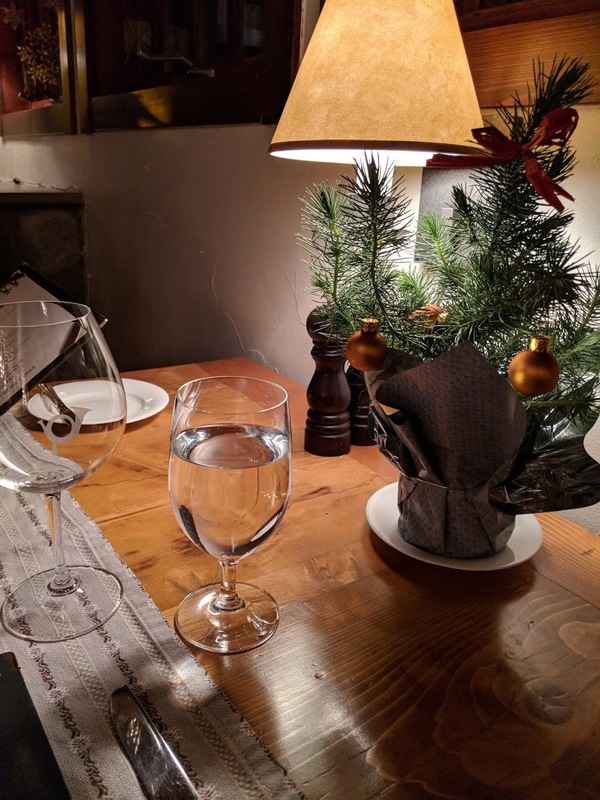 We have stayed here many times, returning again and again for the warmth and elegance of the accommodations, the delicious food and remarkable wine selection, and the sense of calm and relaxation that being at the Post provides, but this was our first time to visit in the winter. 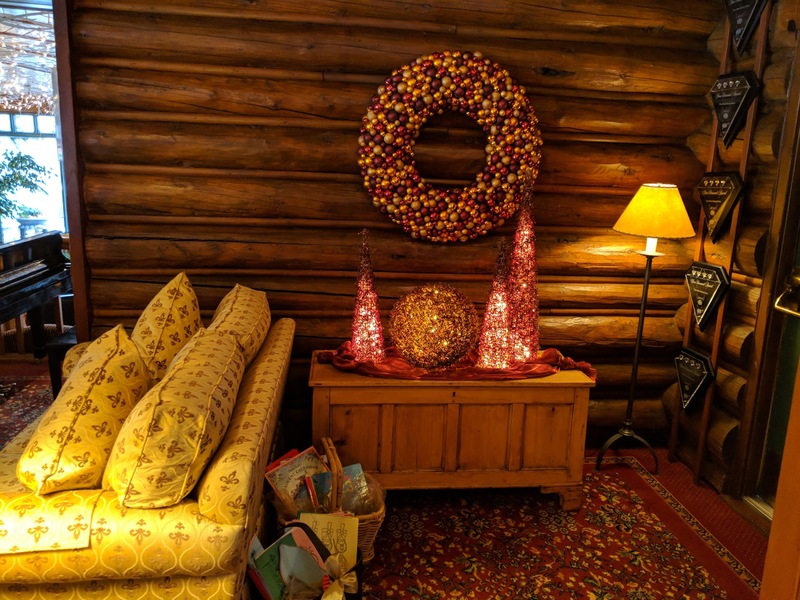 Since we’re so used to seeing it in the late summer or fall, we found the Post to be transformed outside by the snow, crisp air, and twinkling white lights, and inside by the abundant but very tasteful Christmas decorations. 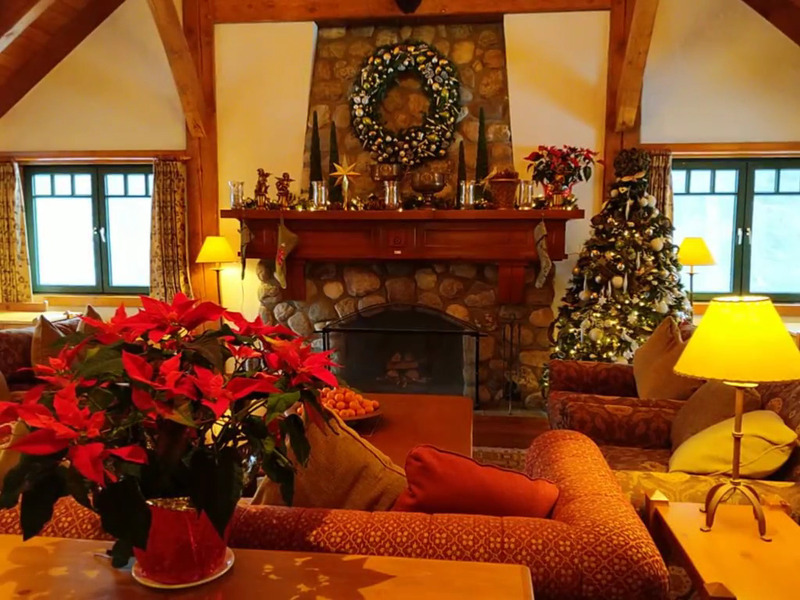 Here’s another view of this amazing room – and though there was no roaring fire, you can just feel the warmth, can’t you? 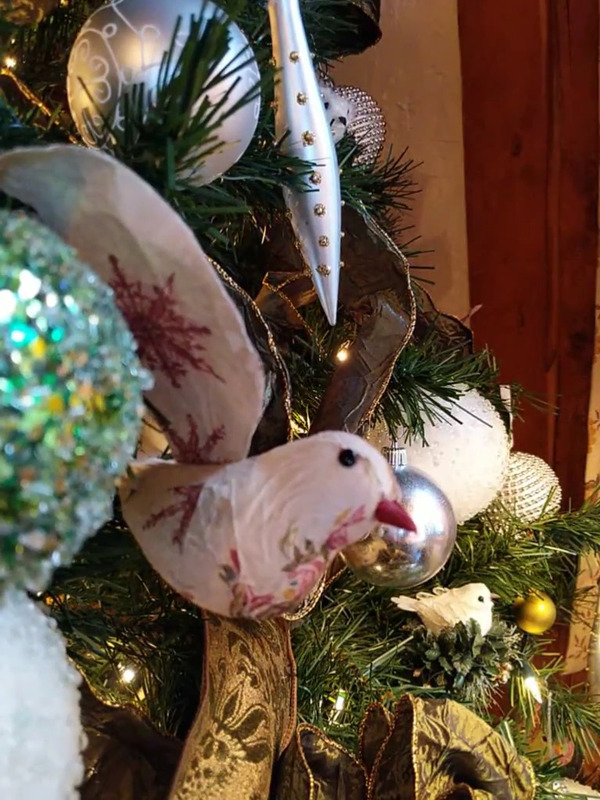 Here’s a close up shot of the tree – I was absolutely taken with the delicate paper bird ornaments. Take a close look – they’re amazing! And I love that such care and attention to detail exists even in this room although it is quite often occupied by only one or two guests. 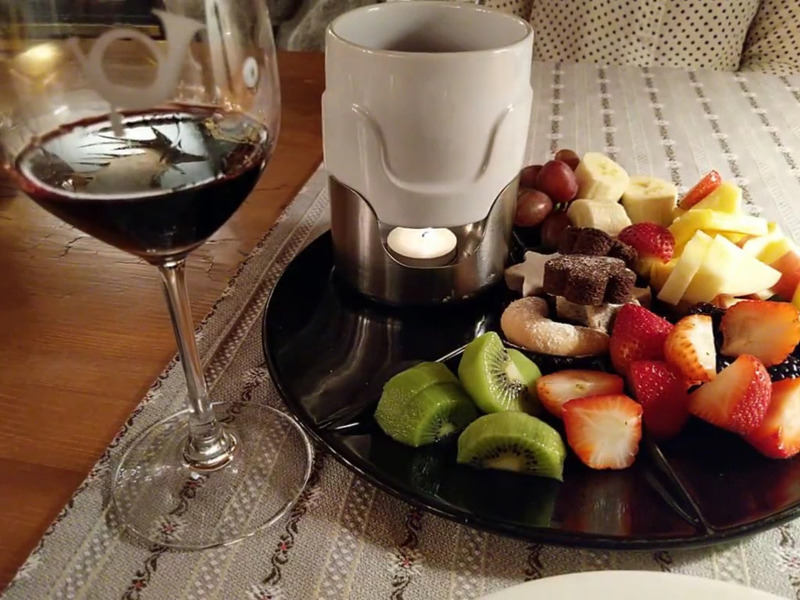 In fact, as you wander and gaze throughout the hotel, there are little touches everywhere that foster Christmas magic, from elegantly decorated alcoves, to tiny trees gracing the table at Fondue Stubli, the hotel’s fondue restaurant. 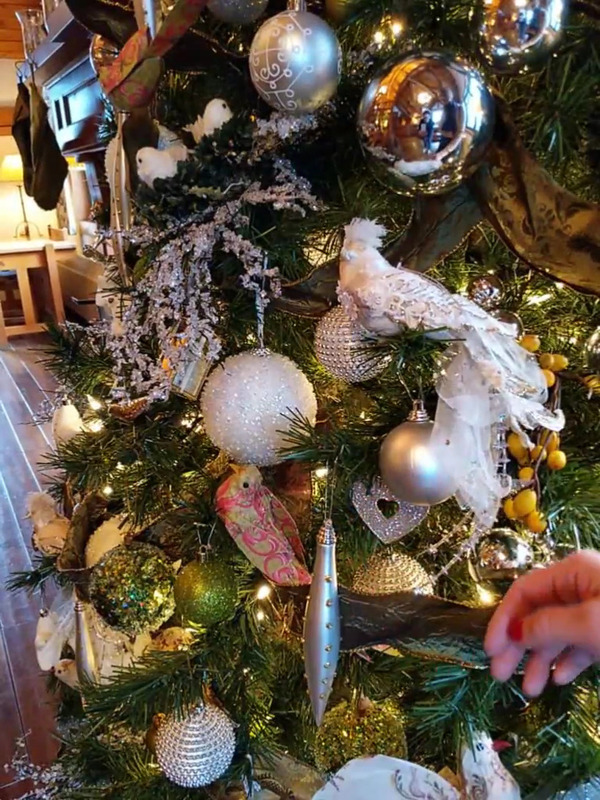 Though Christmas was everywhere at the Post – inside and out – there was nothing overdone or gaudy about it. Everything was done with such exquisite taste that the effect was pure romance and delight. 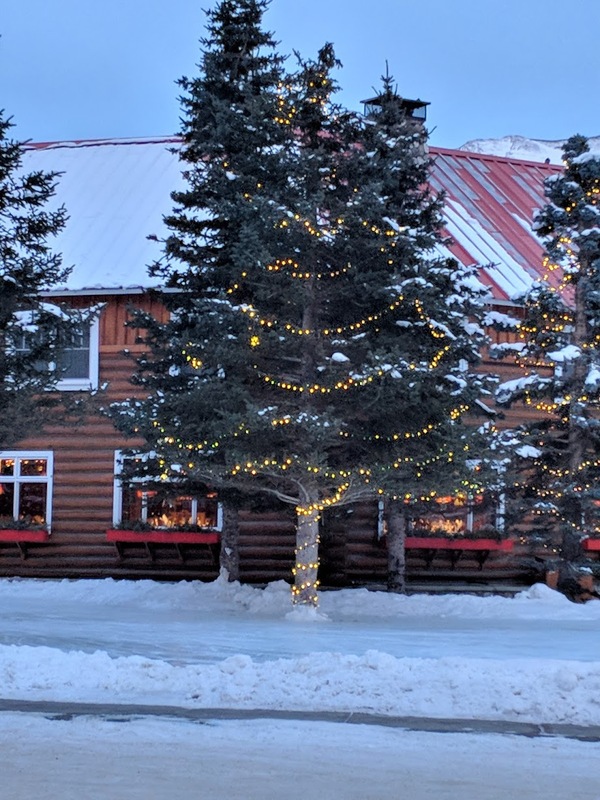 I’m writing about this because it was not our intention to have a “Christmas vacation”, but our stay at the Post definitely put us in the spirit. 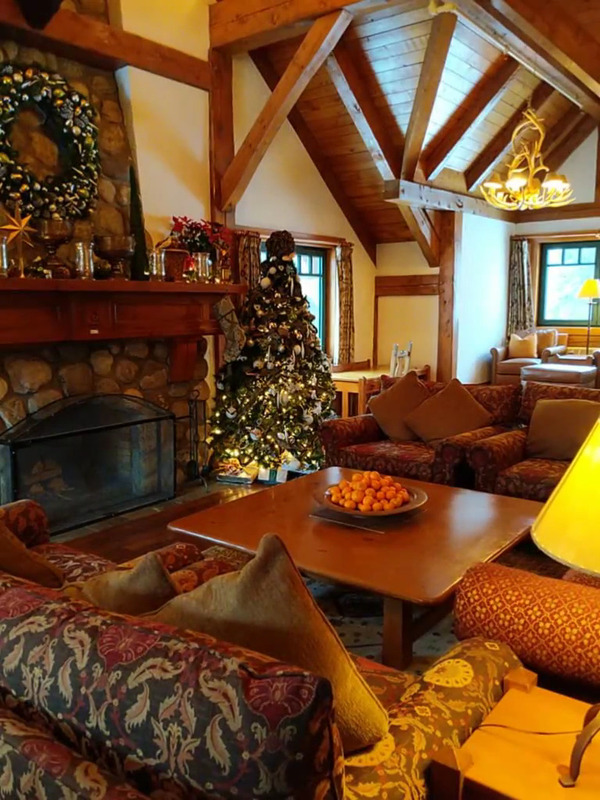 If you are looking for that ‘white Christmas at a ski chalet’ mood, I highly recommend it. I will note that we stayed mid-December wrapping up our trip on December 18th. This was apparently just before it was about to get significantly busier with families and travelers on holiday. 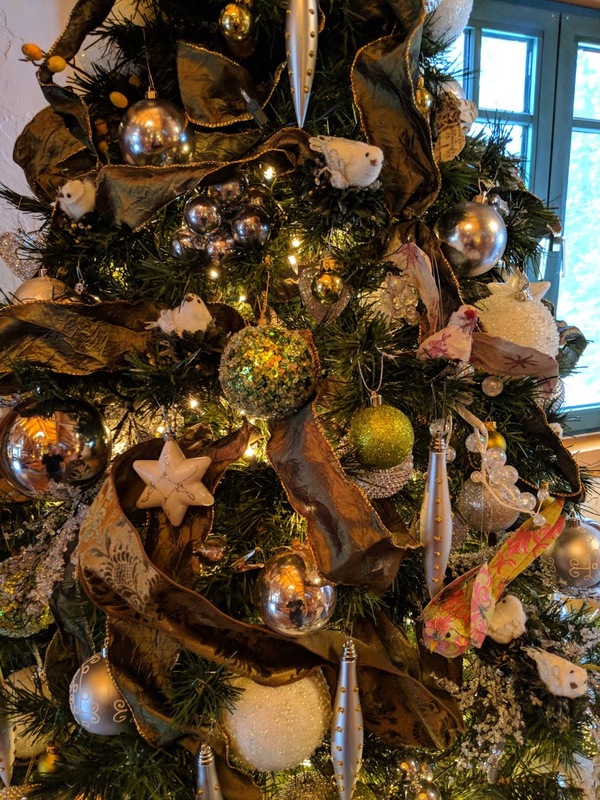 While this would have had its own loveliness I’m sure, we felt that we got to enjoy the best of both worlds – the lovely sights and sounds of the season, but also the rest and quietness we craved. 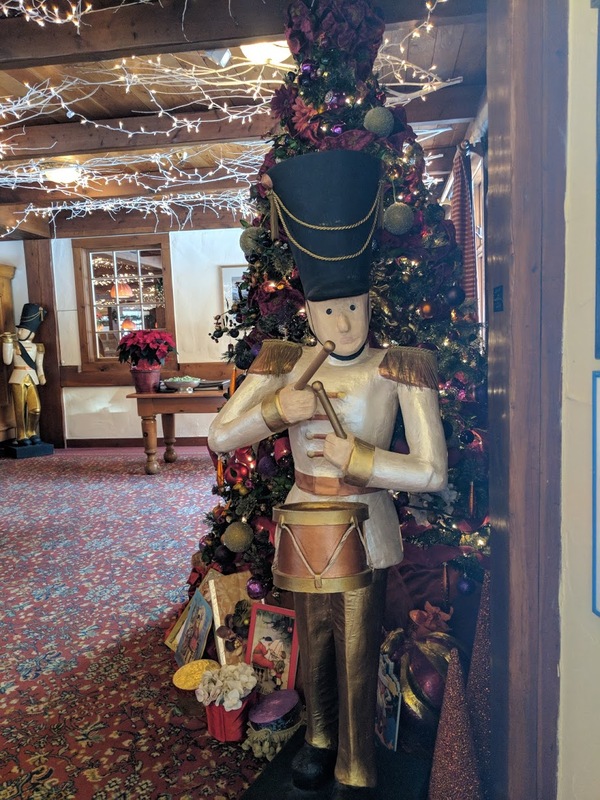 …to all a goodnight at the Post Hotel in December!